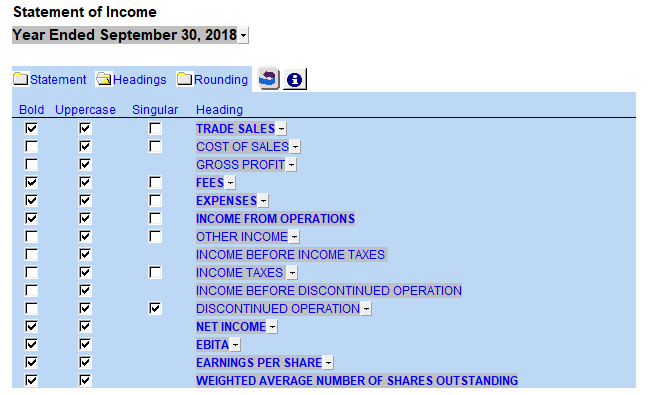 How do I change the case and bolding in the Jazzit financial statement headings? 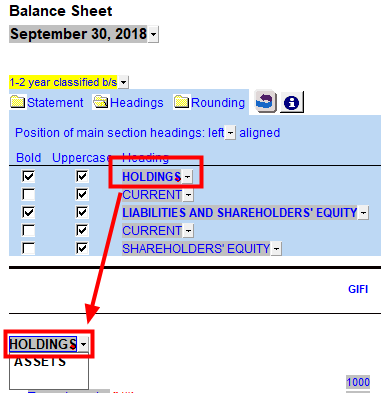 The Jazzit financial statements include controls to modify the case (upper and lower) and bolding (bold and unbolded) of section headings. 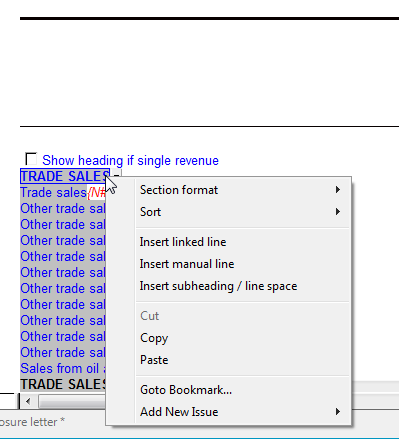 Each section heading can be modified individually. 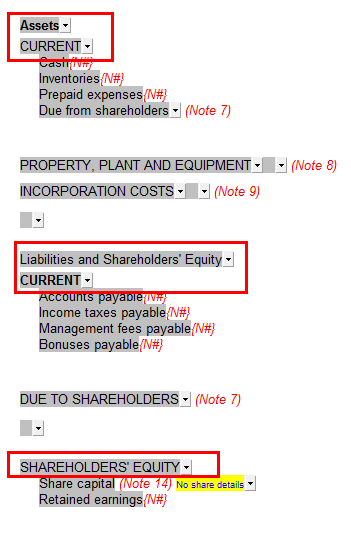 The case and bolding controls can be found in the Headings panel located under the respective headings of the Balance Sheet, Income Statement, Statement of Retained Earnings, Cash Flow and Schedules. Click on the folder icon next to Statement settings to reveal the controls. The functionality itself is fairly straightforward. 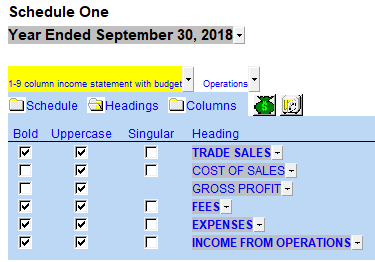 Column headings describe the formatting being activated with the related checkboxes. For example, checking the box under Bold will apply bold to the heading while unchecking will unbold it. 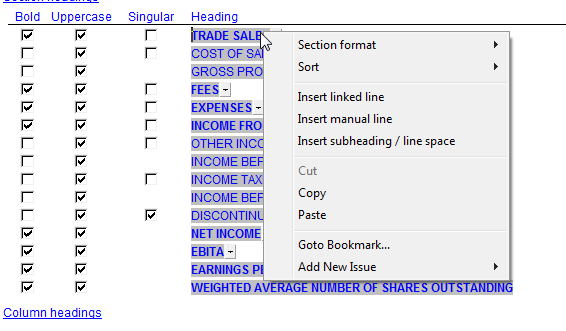 The wording of a particular heading can be changed in the Heading column. Click on the dropdown to see the available options. You can also type an alternate description directly into the dropdown. An override indicator will appear when you do this. The description can also be typed into its actual location in the statement. 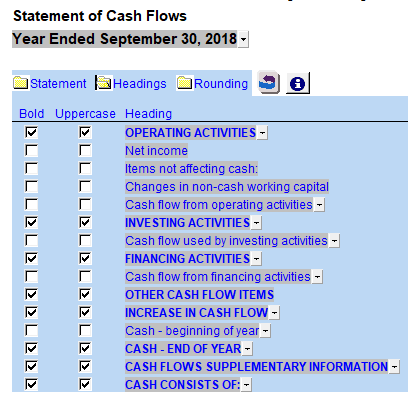 Here are the same options as presented in the Cash Flows. The above controls can be set as Firm wide preferences by modifying the appropriate Resource centre modules. These modifications are performed by the Jazzit administrator. 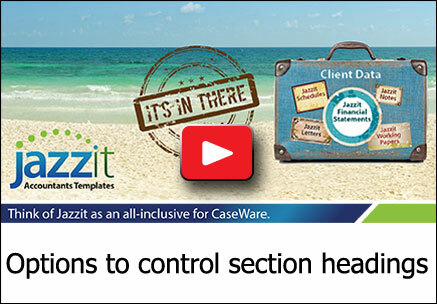 Please see the Jazzit administrator guide for more information on modifying the Resource centre modules. 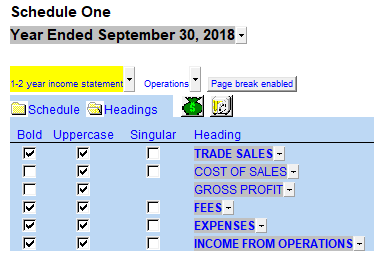 Options found by right-clicking on the section heading can also be found when right-clicking on the corresponding item under the heading column.